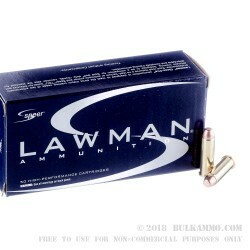 Speer presents their Lawman line of ammunition as being as close as possible to their personal defense loads, but for a price that will turn lengthy training sessions into a more palatable pastime. 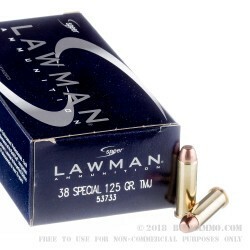 This 38 Special cartridge’s 125 grain projectile’s lead core is seamlessly and totally encased within its one-piece full metal jacket. 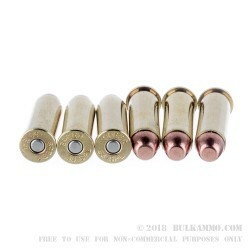 This feature will not only protect your bore against lead fouling, but also keep hot propellant gasses from evaporating the lead in the bullet’s base so you’re not breathing toxic fumes while you’re perfecting your aim. 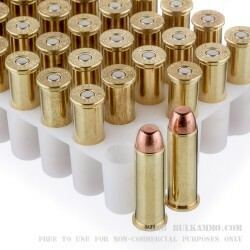 This cartridge’s reloadable brass case is manufactured according to very tight tolerances for optimum performance, its non-corrosive CCI primer offers sensitive and reliable ignition, and its clean burning propellant delivers a consistent muzzle velocity of 865 fps while ensuring stable chamber pressures. There is little wonder why Speer’s tech-laden products are favored by so many law enforcement professionals both on and off the clock.